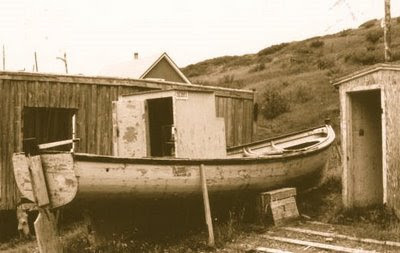 This photo of a herring boat from Trout River, Newfoundland, is taken from Paul Dwyer's Folklore MA Thesis: "The Design, Construction and Use of the Bay of Islands Dory: A Study in Tradition and Culture." The thesis is an examination of dory building the Bay of Islands in Western Newfoundland, looking at the issues of design, construction and use. Written in 2000, the thesis is now hosted online ast part of the thesis digitization project of Memorial University's Digital Archive Initiative (DAI). From books and maps to photographs, periodicals, video and audio, the DAI hosts a variety of collections which together reinforce the importance, past and present, of Newfoundland and Labrador's history and culture.